Shaped like green mini-trees, broccoli is a true dietary powerhouse, full of nutrients beneficial for digestion, heart health, and the immune system. High in fiber and vitamin C, broccoli is a good source for potassium, vitamin A, and B6. Research has established that these nutrients, along with other compounds in broccoli, have anti-inflammatory, and cancer-preventing properties. 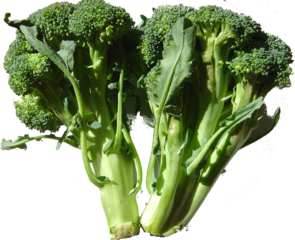 Broccoli’s secret weapon is two chemicals: sulforaphane and indole-3-carbinol (I3C). These chemicals boost the body’s ability to detoxify, help moderate estrogen levels, and have been shown to slow the progression of tumors. It’s easy to add broccoli to your diet because you can enjoy it raw, steamed, in stir-fry, soups, slaws, and even in a green smoothie. A serving is one cup; aim for two to three servings per week. Purchasing tips: Choose organic broccoli florets that are uniformly colored (dark green, sage or purple-green, depending upon variety) and with no yellowing. Store in a plastic bag, with no extra air trapped inside, in the fridge for up to a week. Pungent garlic and spicy red pepper are balanced by the light sweetness of green broccoli in this dish (omit the Parmigiano-Reggiano to make vegan). It also makes for a wonderful side dish with the fish of your choice. Cook garlic in oil in a heavy medium saucepan over medium-high heat, stirring occasionally, until fragrant, but not brown. Add broccoli, water, red-pepper flakes, 1/2 tsp salt, and 1/4 tsp pepper and cook, covered, stirring occasionally, until broccoli is tender and almost all of liquid has evaporated, 12 to 15 minutes. Meanwhile, cook orecchiette in a pasta pot of boiling salted water (2 Tbs salt for 6 quarts water) until al dente. Reserve 1 cup cooking water, then drain pasta. Toss pasta with broccoli, cheese and 1/2 cup reserved cooking water. Season with salt; thin sauce with more cooking water if desired. Serve with extra cheese for sprinkling. ‘Tis the Season for: Soups!